This weekend, I spent several hours working on a stack of Iceland covers that I purchased a few months ago on eBay. 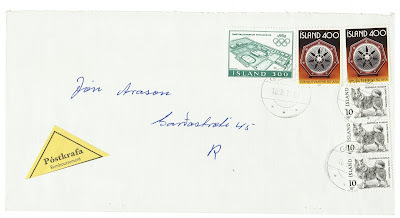 I've always loved the stamps of Iceland and they tie in nicely with my interest in polar philately. I find myself drawn to stamps from countries with small populations and Iceland really fits this bill. It's largest city Reykjavik, the capital, has a population just over 120,000 and the country as a whole has a population of around 329,000. Just think about it, we could relocate the entire country of Iceland to a couple of Houston neighborhoods. 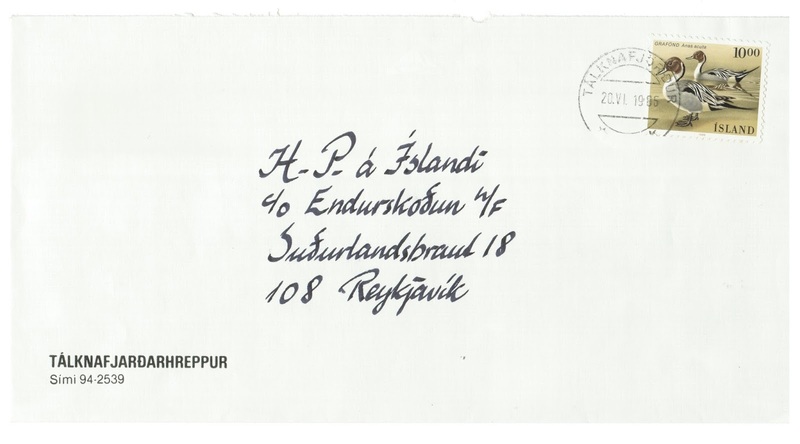 With the small population in mind, a noticed several of my covers are registered mail from one Icelandic community to another. Most of these were from towns in the capital region, suburbs of Reykjavik, to other towns in the capital region. The capital area includes Reykjavik and the towns of Álftanes, Garðabær, Hafnarfjörður, Kópavogur, Mosfellsbær, and Seltjarnarnes. I also noted at least eight Reykjavik post office cancels with designations such as Reykjavik 1, Reykjavik 2, etc. 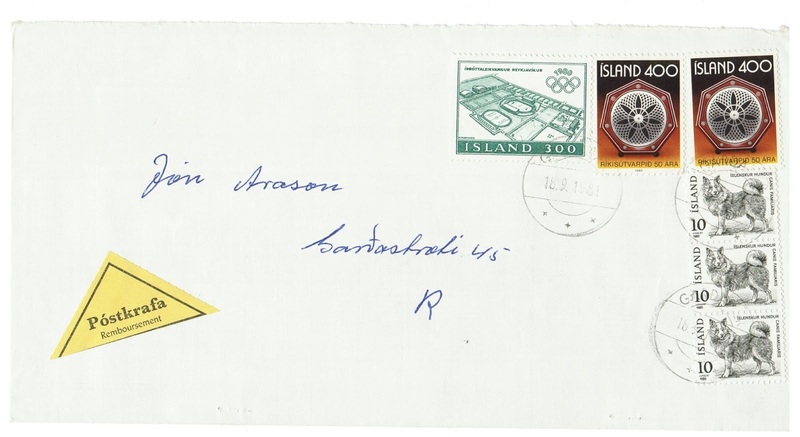 One of the more interesting covers from the capital region was a cover from Garðabær to Reykjavik with a triangular yellow label inscribed "Póstkrafa Remboursement." I'm not confident of the translation, but I believe it is "Silver Reimbursement." Other covers were from more remote and less populous regions. I found a great cancel from Hofsós, population 161. It's a window envelope, however, and the destination is unknown. 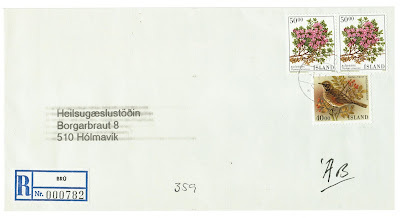 Another great cover is Scott #619 from Tálknafjörður, population 286, located on a fjord in the Northwestern Region of the country, to Reykjavik. 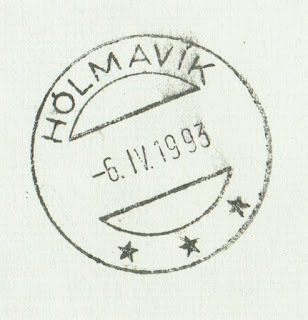 My favorite cover of the group, however, is a registered cover from Brú to Reykjavik via Hólmavík, population 337 (town cancel on reverse of cover). The Wikipedia only has a stub record on Brú. It reads: "Brú is a farmstead and road junction in northwestern Iceland in Vestur-Húnavatnssýsla county. It is located in the Northwest Political constituency. It has a filling station and a guesthouse. It is located at the southern tip of Hrútafjörður where the river Hrútafjarðará has its estuary with the Arctic Ocean." I feel like I own a treasure! To help in my research, I put together a list of Cities, towns and settlements in Iceland. I also included a multiplier for calculating the value of covers. The idea is to value the cover based on the catalog value of the stamps times the multiplier. For example, a cover with $1 catalog value worth of stamps from Reykjavik (2x multiplier) is worth $2. If the same cover was registered (2x multiplier), then it would be worth $4. These cover values do not apply to First Day Covers (FDC). Michel gives prices for FDCs in its North Europe catalog beginning with the issues of 1934. Also, these multipliers do not apply to Scott Numbers 1-44B or O1-O12. These early covers are priced in the Scott Classic Specialized Catalogue. This is just a rough estimate of the price, and I haven't done a lot of research on this. I'm just using it as a guide for rarity and for recording the covers in my collection inventory. Over time, I might revise my estimates, or I might not, but here's the list for your review. And, to give credit where credit is due. I pulled the city data from Wikipedia.